Jewish organizations in the United States welcome recognition of Jerusalem as Israel’s capital, embassy move there. Jewish organizations in the United States on Wednesday welcomed President Donald Trump’s announcement that the U.S. recognizes Jerusalem as Israel’s capital. “Over 3000 years ago, King David constructed the holy city of Jerusalem as the capital of Israel. For millennia, Jews around the world directed their prayers toward Jerusalem and prayed to return to Jerusalem. Indeed, the prayer to return to Jerusalem is invoked at the conclusions of the sacred Yom Kippur service and the Passover Seder. In 1948, when the modern State of Israel was miraculously founded, its leaders – of course – chose Jerusalem as the capital even though Arab armies occupied Judaism’s holiest sites. With G-d’s help, the city was reunited in 1967 and it has flourished ever since. Under Israeli rule, Jerusalem is an open city where people of all faiths may freely visit and worship at their holy sites,” it said. The National​ ​Council​ ​of​ ​Young​ ​Israel​ also applauded the decision, saying: "The​ National​ ​Council​ ​of​ ​Young​ ​Israel​ ​applauds​ ​President​ ​Trump’s​ ​decision​ ​to​ ​move​ ​the​ ​American Embassy​ ​from​ ​Tel​ ​Aviv​ ​to​ ​Jerusalem. "NCYI’s​ ​firm​ ​stance​ ​is​ ​that​ ​Jerusalem​ ​is​ ​not​ ​only​ ​the​ ​eternal​ ​capital​ ​of​ ​the​ ​Jewish​ ​people,​ ​but​ ​that Israel​ ​does​ ​not​ ​have​ ​secure​ ​borders​ ​without​ ​Jerusalem. "This​ ​decision​ ​has​ ​overwhelming​ ​bipartisan​ ​support​ ​in​ ​Israel​ ​and​ ​America.​ ​It​ ​has​ ​been​ ​over​ ​20 years​ ​since​ ​the​ ​Jerusalem​ ​Embassy​ ​Act​ ​was​ ​approved​ ​by​ ​a​ ​93-5​ ​vote​ ​in​ ​the​ ​U.S.​ ​Senate.​ ​We​ ​note that​ ​Democratic​ ​leader​ ​of​ ​the​ ​Senate,​ ​Chuck​ ​Schumer,​ ​has​ ​publicly​ ​supported​ ​moving​ ​our Embassy​ ​to​ ​Jerusalem.​ ​This​ ​decision​ ​has​ ​only​ ​been​ ​touched​ ​on​ ​and​ ​hinted​ ​at​ ​by​ ​former presidents,​ ​while​ ​President​ ​Trump​ ​is​ ​the​ ​first​ ​to​ ​keep​ ​it." The Conference of Presidents of Major American Jewish Organizations welcomed Trump’s announcement as well. "Today, nearly seventy years after the founding of the modern State of Israel as the national homeland of the Jewish people, the United States has officially recognized Jerusalem as the capital of Israel,” said Stephen M. Greenberg, Chairman, and Malcolm Hoenlein, Executive Vice Chairman/CEO, of the Conference of Presidents. “Since 1949 the seat of Israel’s government has been in Jerusalem. This historic change in U.S. policy rights a longstanding injustice,” they added. “The Conference of Presidents is gratified that its decades-long policy calling for U.S. recognition of Israel’s capital in Jerusalem has now been realized,” said Hoenlein and Greenberg. “For nearly 3,500 years, the Jewish people have maintained an indivisible bond to Jerusalem. It is truly fitting that President Trump has taken this step just days before Jews all over the world begin celebrating the festival of Hanukkah marking the return of Jewish sovereignty over Jerusalem and the rededication of the Temple, the holiest site in Judaism, more than 2,000 years ago. U.S. recognition of Jerusalem as the capital of Israel also sends a strong message to the international community that attempts in the UN to erase the Jewish connection to Jerusalem are counterproductive and will not succeed," concluded Hoenlein and Greenberg. 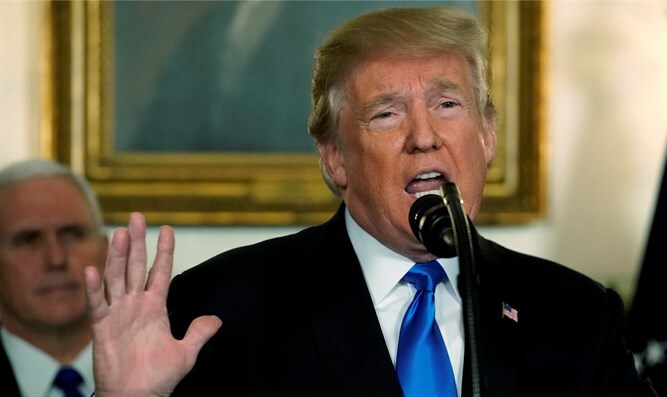 TORA, the organization of Traditional Rabbis of America, released the following statement: " TORA applauds and expresses our deep gratitude to President Trump for his courageous and historic decision to recognize Jerusalem as the capital of Israel and to begin the process of moving the American embassy in Israel from Tel Aviv to Jerusalem." "This decision, which implements a law passed by Congress in 1995, acknowledges the reality that each sovereign nation can choose the location of its capital and the eternal bond between the Jewish people and the city of Jerusalem that dates back to the Bible. Jews, who for millennia have yearned for the divine presence to return to Jerusalem, rightly take pride in American confirmation of these bonds and this reality. It corrects the absurdity of denying the political and physical reality of the location of Israel’s capital since statehood was declared almost seventy years ago. The Coalition for Jewish Values (CJV), the largest Orthodox rabbinic public policy organization in America, noted that every other country chooses its capital, and all other countries place their embassies in those same cities to facilitate access to officials of the host government. Rabbi Pesach Lerner, President of the CJV said: "President Trump's decision is correct politically and pragmatically. It is previous Presidents, European and Arab leaders who should be questioned regarding their double standard applied uniquely to Israel. We hope the President starts and completes his pledge to move the embassy, as well."